Family Records and Genealogies are personal needlework pieces that list the particulars of the members of the family which they chronicle. They were particularly popular in Maine and Massachusetts, Maine being part of Massachusetts until 1820. They provide a fascinating view of family life and are historically important, giving us a glimpse of life in an earlier America. Looking through the most tightly focused close-up lens of history, these needlework pictures powerfully connect us with the individuals. For, with their revelatory names and dates, these samplers have the ability to telescope history . . . to connect us directly to the personal past: to one specific girl, in one location, at one particular moment in time. The popularity of these genealogical embroideries between 1785 an 1825 parallels the rise in family group portraiture in oil on canvas. Both are decorative expressions of the emerging perception of the family as a private, close-knit, domestic unit unique, fragile, and precious. All offer interesting information on the early family: size, frequency of birth, spacing of children, precariousness of life and prevalence of death as well as patterns in naming . . . A virtual treasure trove of information for the historian. According to Betty Ring in Volume I of Girlhood Embroidery, "The earliest dated embroidery within Portland s first and largest group was worked in 1822 and it was preceded by a closely related scene that was painted on paper and dated 1821. Both the school that produced these and the artist who drew them are undetermined" . . . The Winged Cherubs in this group appear on monuments in the mourning samplers or are sometimes found in the sky or in various places on related samplers as in Fig 294, p.255 of Girlhood Embroidery which is conceptually identical to this sampler worked in 1822 by Almira Lincoln. These Winged Cherubs are almost like the signature of the unknown artist. 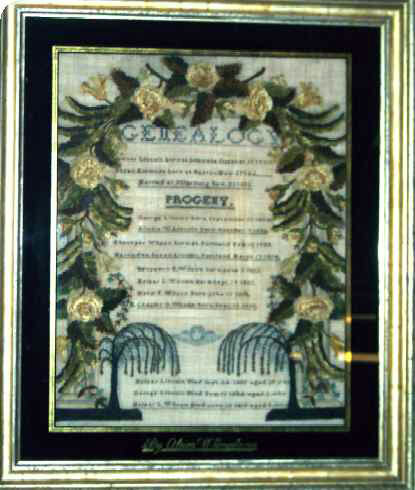 It is speculated by Ms. Ring that perhaps after 1826, the latest death date found within this group, that this type ceased to be made and that the artist became unavailable though the school continued as the type of sampler like this one made by Almira Lincoln continued to be made but without the winged cherub element. "There were a number of Portland boarding schools that may have produced these embroideries, however the most logical place of their origin was the school of the Miss Mayo s for it is the only Portland school of this period known to have been celebrated for exquisite needle work, both plain and ornamental." Coincidentally, Martha, the eldest daughter of Martha Marchant, of Boston, who married Simeon Mayo of Portland in 1778 and founded the Mayo school, married Reverend Thomas B. Ripley when she was 45 years old in 1827 and they soon left Portland. If the Mayo school produced these Winged Cherub Samplers and Martha was the designer, then her marriage would explain their abrupt end while the school continued until 1848. This Genealogical sampler for the family of Melzer Lincoln, dated 1822 is worked in silk, chenille, and graphite on linen. The drawing of the columns and the winged cherub's head place this sampler firmly in the Winged Cherubs Group and other such silk embroideries. A similar genealogy of the Bryant family is in the Maine Historical Society and another is pictured in Betty Ring's book, Fig 294. Almira, who was born at Georgetown, Sagadahoc, Maine on 07 Oct 1805, worked her sampler in 1822 when she was 17 years old. Almira was the daughter of Melzer Lincoln and Susan Emmons. 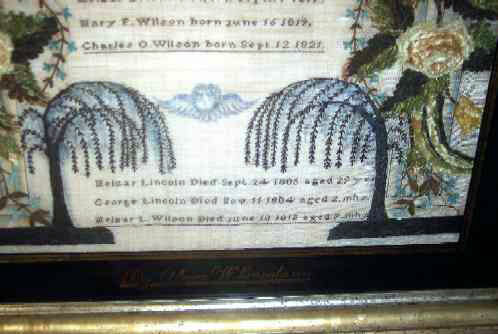 Her older brother, George who was born in 1804 died at 2 months of age, along with her father Melzer, who died in 1805 at age 29 years and Melzer Wilson, a half brother by Susan s second marriage to Ebenezer R. Wilson are memorialized on this sampler. Almira never knew her father as he died in the year she was born so Ebenezer Wilson is the only father she ever knew and the offspring from his marriage to her mother Susan are the only brothers and sisters she knew. Almira married Ezra Holden in Portland on June 1, 1830. Technically excellent, this highly sophisticated sampler is lushly and expertly worked on linen in Chenille with graphite embellishments and is in excellent condition. The eglomise mat is signed (reverse painted on the glass in gold) By Almira W. Lincoln 1822. It is conservation mounted into a lemon gold frame with the original eglomise glass. Like most samplers of this group it is quite large and impressive, made even more so by the fabulous chenille border. It measures 16-1/2" x 21" (sight) and the eglomise mat and lemon gold frame add another 4" all around on each side.